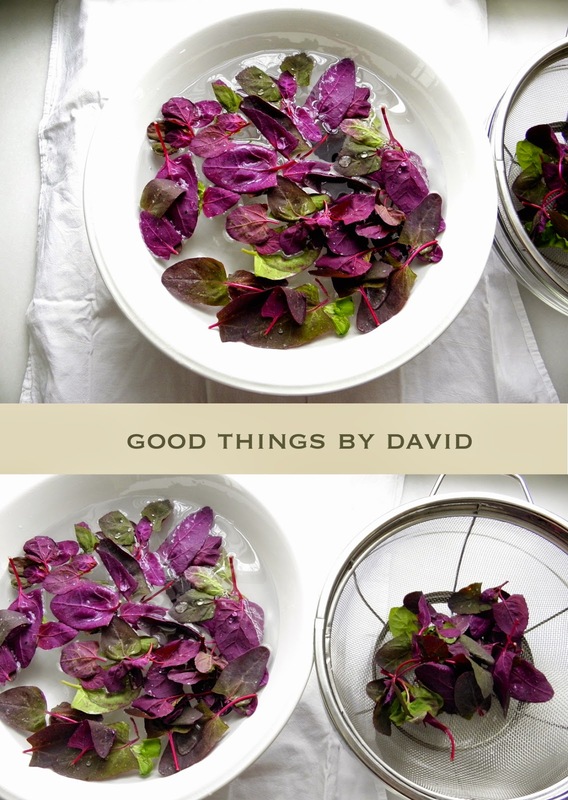 Have you ever tried fresh red spinach from the farmers market? I hadn't until a few days ago when I spotted it while shopping at one of my favorite markets. At first glance I thought it was a mesclun of salad greens, but the sign said it was 'red spinach' so I took a closer look. Never having laid eyes on red spinach, I bought a bunch intending to try it that very night. After looking up information on red spinach, I came to realize that this variety is from the genus Amaranthus, and its species is A. dubius. What we know of as flat leaf or curly green spinach is from the genus Spinacea and its species S. oleracea. Both, however, come from the same family, Amaranthaceae. Red spinach is also known as Chinese spinach (yin choy). Either way, it's worth bringing home a bunch from the market if you ever spot some in the produce aisle. The first order of business is to rinse it very well in cold water. After picking through it for blemished leaves, I place the bunch in one of my sinks and give it a very quick and gentle spray of cold water to remove any surface detritus. Then it's onto a small soak. You'll notice while doing this that the leaves are formed in clusters which you can separate or leave intact. Depending on how you plan to serve these tasty greens, it's up to you what you do with them. In a large bowl, add cold water and with a few handfuls at a time, swish the leaves around very gently so that you don't bruise them. This gentle agitation releases any hard-to-find grit or dirt from the leaves and stalks. The dirt will settle at the bottom of the bowl. Let the leaves sit for a few minutes before transferring them to a colander. You could do this in a water-filled sink if you have several bunches, but a bowl will suffice for a smaller bunch. It's important to use the leaves as soon as possible so that they don't wilt or become unsightly. I wouldn't keep a bunch for more than one day in the refrigerator. 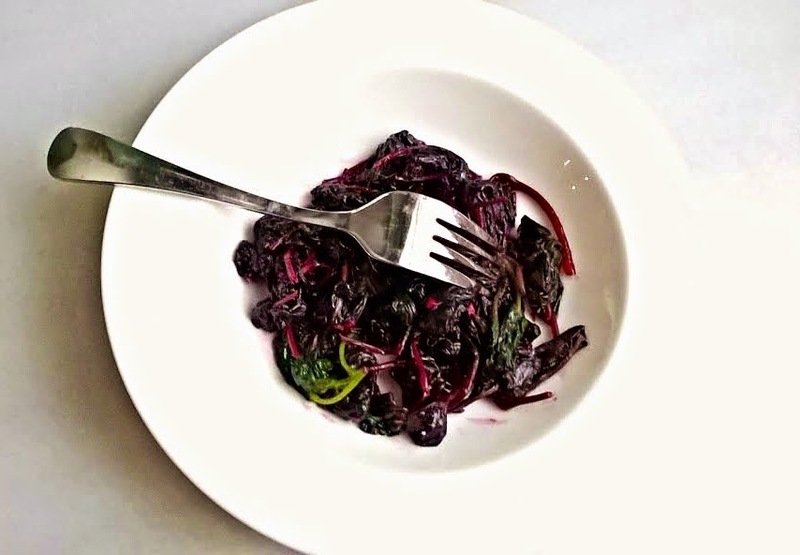 You can simply toss the red spinach in a good olive oil and balsamic vinegar (salt and pepper to taste) or some other vinaigrette of your choice for a simple and delicious salad. If you love curries, why not make some lentil & spinach curry for a healthy dinner? This recipe from Naturally Ella looks delicious! Another way of having this (above photo), which I admit is my favorite way to eat spinach, is to sauté it with some garlic and good quality extra-virgin olive oil until the leaves are just wilted. When it's done, sprinkle a little bit of lemon juice before serving and voila! What's so good about red spinach other than the flavor? Well, for starters, this green has three times the amount of calcium and five times the amount of niacin than regular spinach. It's also a very good source of Vitamin A, C, iron and other essential minerals. You can't help but feel like you're doing yourself some good by eating it, so I encourage you to try red spinach if you ever come across it. Thanks for sharing. I'm going to keep an eye out for red spinach the next time I'm at the supermarket. By the way what does it taste like? You really should look for it Michael. As for the flavor, it's a bit more earthy than regular spinach. It reminded me more of chard if you're familiar with that. Now that sounds delicious, Phil! I'm going to have to try that combination next time. Yum! Phil, it seems like a good combo to me. Thanks for the suggestion. Maybe add some sunflower seeds or nuts to give it crunch. I'll see. David btw. I love the picture here on the heading of this post! March means spring is coming!